The Cuatro Gatos count to 4 in, both, English and Spanish. Cookie Monster and Abby attempt to play checkers. Make a shape snack! Use square crackers, circular orange slices, and cut your sandwich into triangles! How many sides and angles does each shape have? 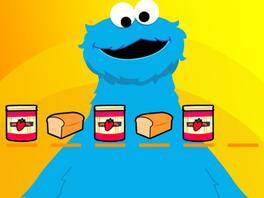 Cookie Monster needs help to sort the food patterns at the grocery store. The next time you make a snack with your child, ask him to help create a pattern with the foods such as cracker, cheese, cracker, cheese. Then eat your pattern!